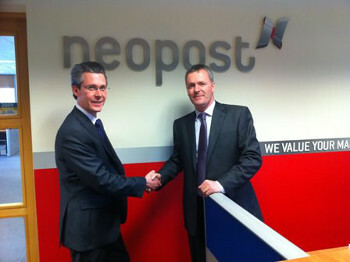 L R Duncan Groom (PFE) is officially welcomed by Cathal O'Boyle MD Neopost IrelandNeopost Ireland, a leading provider of end-to-end mailing solutions has announced the acquisition of Print Finishing Equipment (PFE). The acquisition was made to enhance Neopost Irelands future growth and performance and to position the company as one of the countries leading suppliers in the graphics and print finishing market. PFE brings in market-leading solutions from well known suppliers such as Duplo, Roland, Eurofold, Komfi, Drytac and Fuji. The company has a well established base within the print Industry in Ireland and is regarded as one of the leading suppliers within this sector.